A great prediction trick with a Christmas theme! Quote the beginning of this famous Holiday Poem: "'Twas the Night Before Christmas and all through the house, not a creature was stirring, not even a mouse. The stockings were hung by the chimney with care, in hopes that St. Nicholas soon would be there." Lay your prediction card on the table face down. 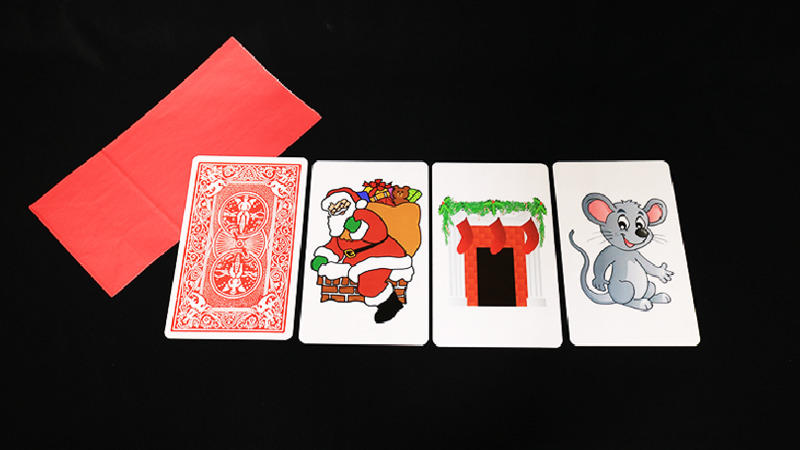 Mix up the 3 red-backed laminated 4 1/2" x 7" Bicycle cards, and have a spectator point to one. They have a free choice to keep that card or give it to you, or you can simply place that card in the red bag. Again, they point to a card and it's their choice to keep or give. With one card in the bag, you offer to trade cards with him. Then the prediction is read. It reads: "I will have the Mouse. You will have the Stockings. In the bag will be St. Nick (Santa Claus)" -- the prediction is always correct! As a bonus, you can then reach into the bag where Santa was, and pull out a small present as a gift for your helper.